The ghoulish festival of Halloween is well and truly upon us, with the annual celebration itself a mere 4 days away. Also known as ‘All Hallows Eve’, it’s a festival of celebration and superstition, honoured in many countries around the world. From apple bobbing to dressing up in costumes and haunting the streets in search of a ‘trick or treat’, there are many ways to celebrate Halloween. But one that we all know and love is of course, pumpkin carving. Traditionally known as Jack-O-Lanterns, in the UK these spooky creations were many, many years ago made from turnips, but as they were an expensive vegetable in America, people begun using pumpkins instead. The idea stuck and they’re now considered the Halloween vegetable of choice! Or if you’re on any of our three resorts this October half term, don’t miss out on our children’s pumpkin carving activities! Plus! In the spirit of Halloween, we’re hosting a fang-tastic competition, giving you the chance to win a bundle of Skyline Gang toys. All you have to do is carve your most petrifying pumpkin yet and post a photo of it on social media using the hashtag #ButlinsPumpkin. Well, what are you waiting for?! Use our top tips and get carving! The “Promoter” of the prize draw is Butlin’s. Butlins Skyline limited, 1 Park Lane, Hemel Hempstead, Hertfordshire, HP2 4YL. Registered in England No. 04011665. The Promoter and all entrants acknowledge that Facebook, Twitter and Instagram are in no way responsible for the administration or execution of this competition and this promotion is not sponsored or endorsed by Facebook, Twitter or Instagram. The competition runs from 10:00am on 27th October to 23:59pm on 31st October 2016. All winners will be announced no later than the 2nd November 2016. To enter you must share an image of your carved pumpkin on either Facebook, Twitter or Instagram and Hashtag #ButlinsPumpkin (For Twitter Users Only). This Competition is open to United Kingdom residents aged 13 and over only, excluding employees of Bourne Leisure, Butlins Skyline Ltd., their immediate families, their agents, or anyone professionally associated with this promotion. Entries must be the original work of the author. Entries which are or appear to be plagiarised will be disqualified. Entries (including but not limited to text and photographs) for this competition must not contain any content that is defamatory, libellous, racist, homophobic, derogatory, pornographic, obscene, sexist, illegal, and/or otherwise inappropriate. Entrants must not do anything illegal and/or dangerous and/or that would put themselves or others at any risk. You must get the prior consent of anyone who features in your entry. Any entrant under the age of 18 must obtain a parental/guardian consent to enter into this promotion. The winner under the age of 18 will be required to provide a written parental/guardian consent that he/she was allowed to enter into this promotion and can accept the prize. All entries submitted via Facebook, Twitter or Instagram will have equal chance at winning the prize. 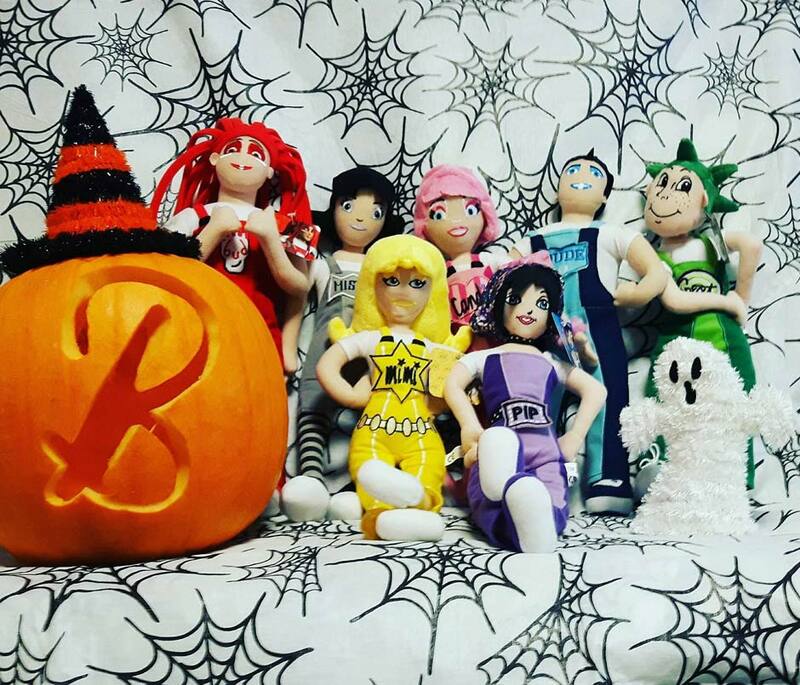 There is no limit on the number of different pumpkin carving image entries you can submit. Entries will be judged and the winning image will be those we deem to have the best carved pumpkin. Judges decisions are final and no correspondence will be entered into. There will be one main prize which is a collection of Skyline Gang toys. Butlin’s will contact the winners directly via direct message on the social media.The winners must send a direct message to Butlin’s via social media with their name and address within 48 hours of being chosen – Butlin’s will send your prize to this address within two weeks of receiving these details. The address must be based in the UK. If we do not hear from you within 48 hours your prize will be forfeited. The prize is subject to availability and we reserve the right to offer an alternative prize of equal or greater value. Entrants will retain copyright in their submitted entries, however, by entering, all entrants license the Promoter a worldwide royalty-free perpetual license to edit, publish and use each entry in any and all media (including print and online) for publicity and news purposes. The Promoter reserves the right to publish entries (including parts of entries) other than the winning entry and publication does not necessarily mean the entrant has won a prize. The Promoter sharing a photo on their social channels that was submitted using the ButlinsPumpkin, Halloween, Pumpkin or competition hashtag does not indicate that the entrant has won a prize. Winners will be required to participate in reasonable publicity relating to this Promotion (any online/printed publicity featuring the winners’ first name, prize, and photographs). Butlin’s reserves the rights to change these T&Cs at any time.